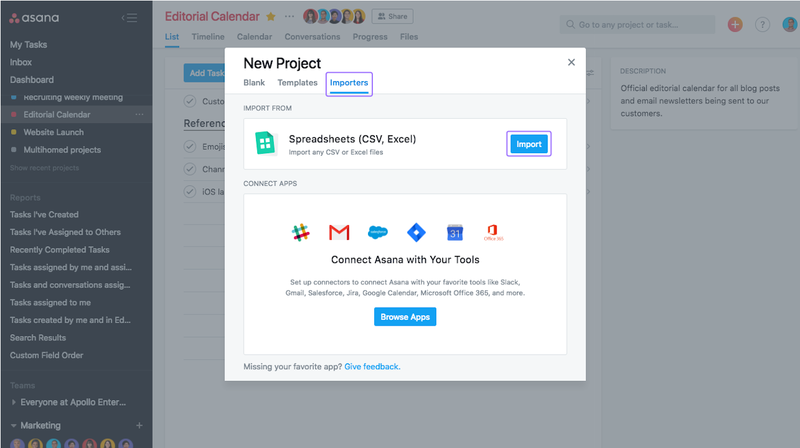 The CSV importer will help you move your workflow out of spreadsheet software such as Excel or Smartsheet to test in Asana, so you can get started right away on any project. 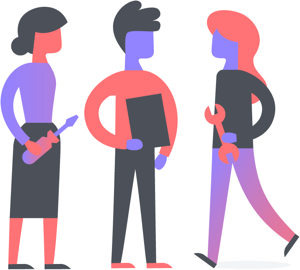 Once imported, you’ll immediately see your rows and columns as trackable tasks with assignees and due dates in a project. 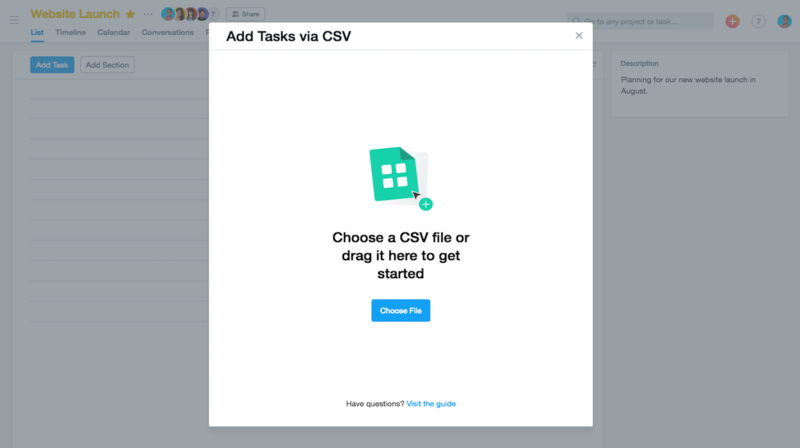 Before you import your CSV, take the time to quickly consider and adjust these things in your spreadsheet. 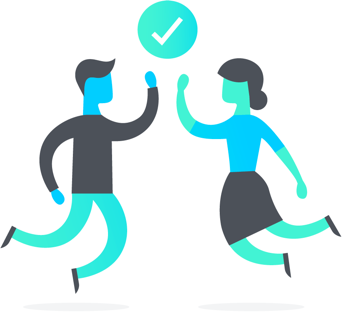 Responsibility: Your column that contains the name of the teammate responsible for the task will be mapped to the assignee field. Note that this needs to be their work email address. 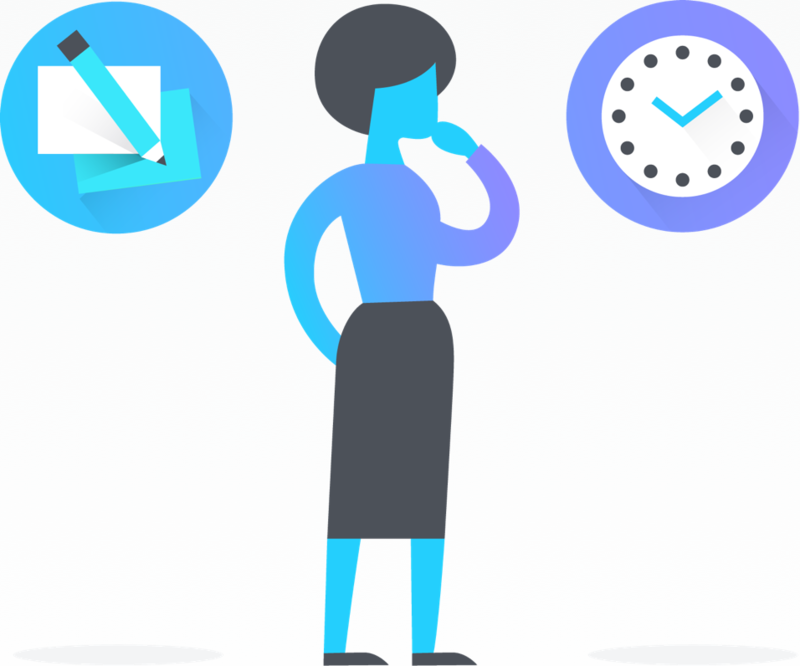 Dates: You can track both due dates and start dates in Asana. In your spreadsheet separate the dates into two columns. 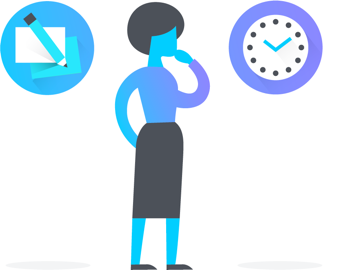 Start dates are an Asana Premium feature and if you are not on the premium version your start date column will appear in the description. Follower: If you’d like to automatically add a teammate as a follower on a task, create a separate column. Add a teammate by their email address, but please note that you can only add one unique follower per task when importing. Other Information: In addition to task name, assignee, or due dates, additional columns can be mapped to custom fields. 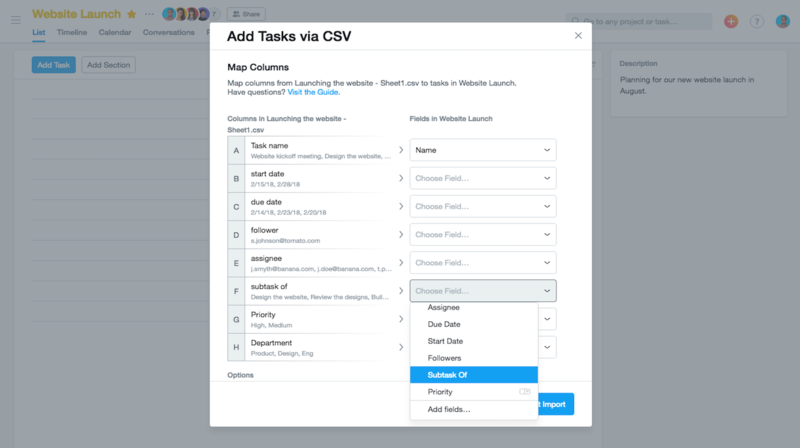 Otherwise additional column information will be listed from top to bottom in the task description field in the order of your columns. Custom fields help you categorize and track priorities; you can also sort or search by field. 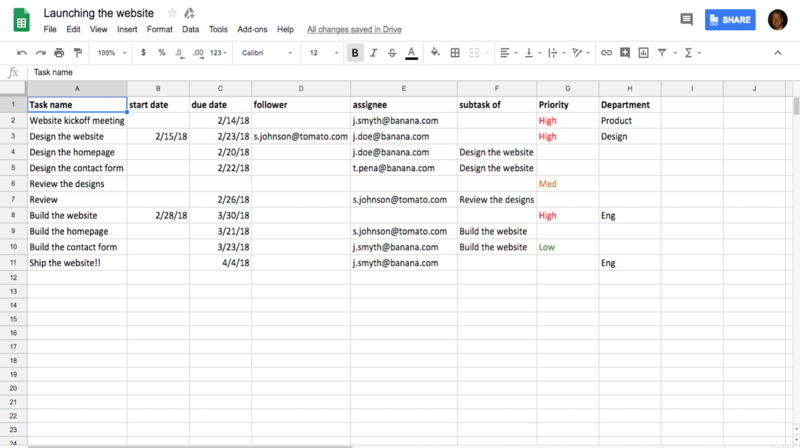 Some good uses for custom fields are priority, project stage, team and estimated time. It’s important to note that your date columns need to be formatted in the standard US date format of month/day/year to import successfully. 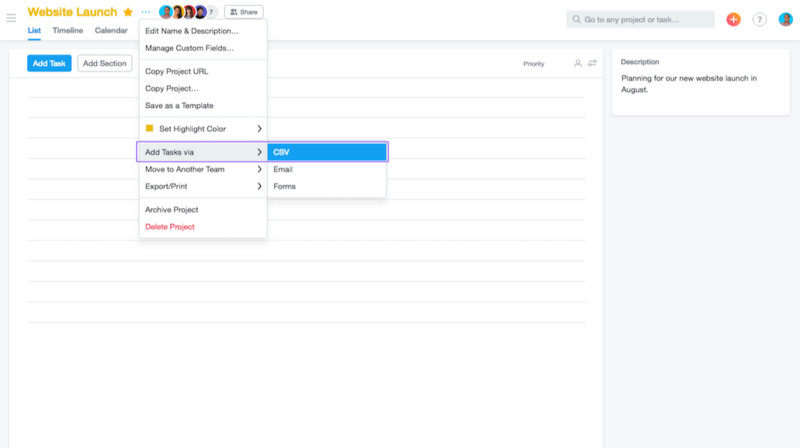 To import tasks to a project in Asana using CSV, select the project header dropdown menu next to your project‘s name, hover over Add Tasks via, then choose CSV. 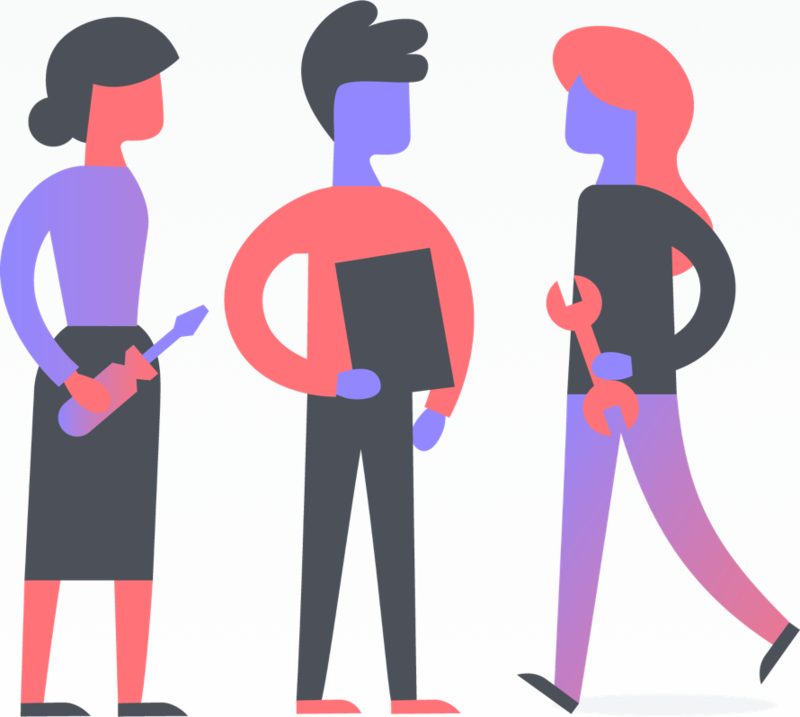 From here, browse for your file or drag it into the importer and then complete the instructions that follow, choosing the project to which you’d like to add your CSV file and the Organization it lives in. The Use first row as the column names box is checked by default, however you can uncheck this if your spreadsheet doesn’t have a header row. 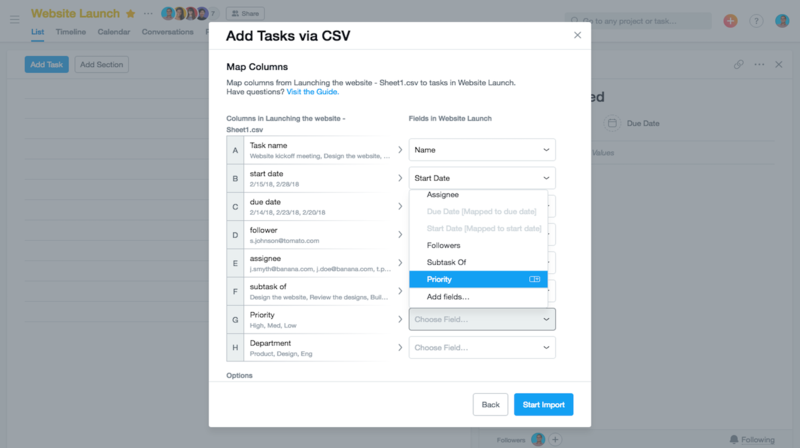 You can then map your columns to task, task assignee, and task due date. If you have custom fields you can select and map these too. 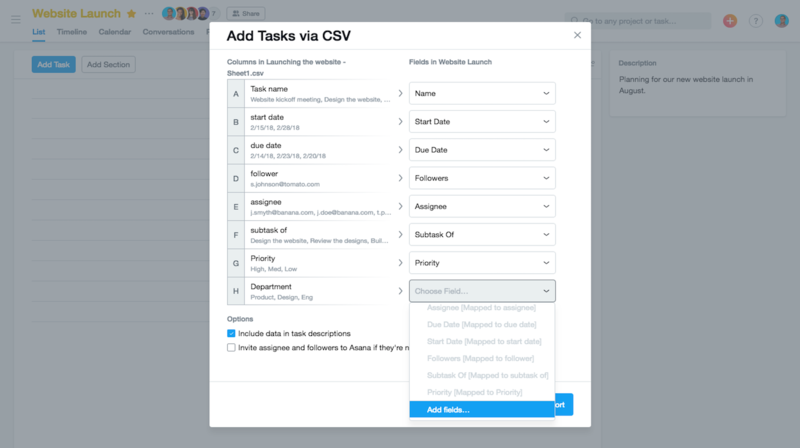 You also have additional options where you can opt to include the task row data in each task’s description and invite the assignees & followers to Asana, if they don’t already have an account. It’s also possible to import a CSV file when creating a new project using the Quick Add feature and navigating to the Importers tab. You can select existing custom fields from the dropdown or create new custom fields directly from the CSV importer. 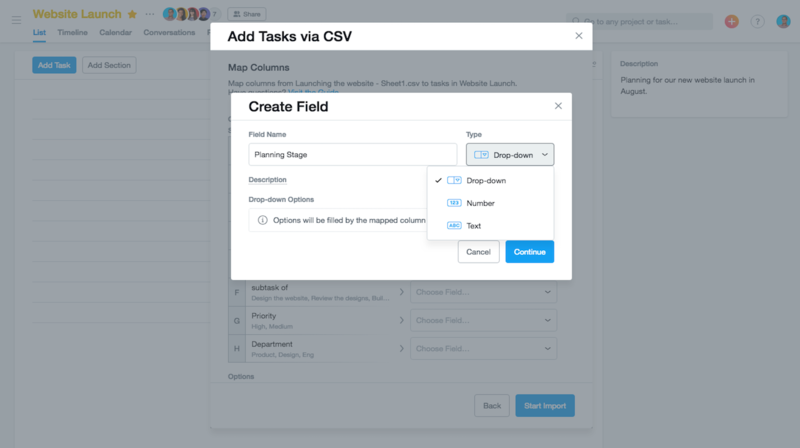 The items in your column need to match your custom field options exactly. If a cell has a spelling error or punctuation discrepancy it will not import a custom field selection. Click on one of the field dropdowns, then scroll to the bottom and select Add fields. From here, you can create a new dropdown, number or text field. 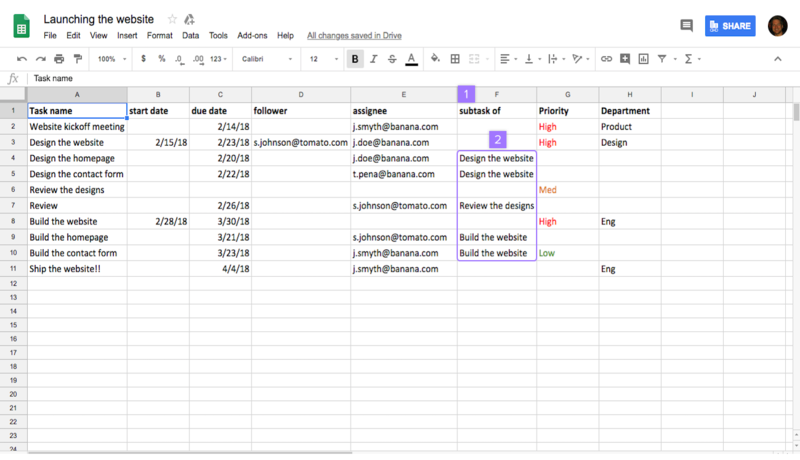 Create a new column in your spreadsheet called subtask of. Fill in the subtask of column with the name of the task in the corresponding row. All other fields (including task name, assignee, due date etc.) should be filled out the same as any other task. In Excel, you can set the subtask of field automatically by typing = and clicking the task name cell you want the row to be a subtask of. Once you get to the “Map Columns” page of the CSV importer Select Subtasks Of from the Fields section and then map your subtask of column to the Subtask Of field. The subtask must appear after the row it is a subtask of. 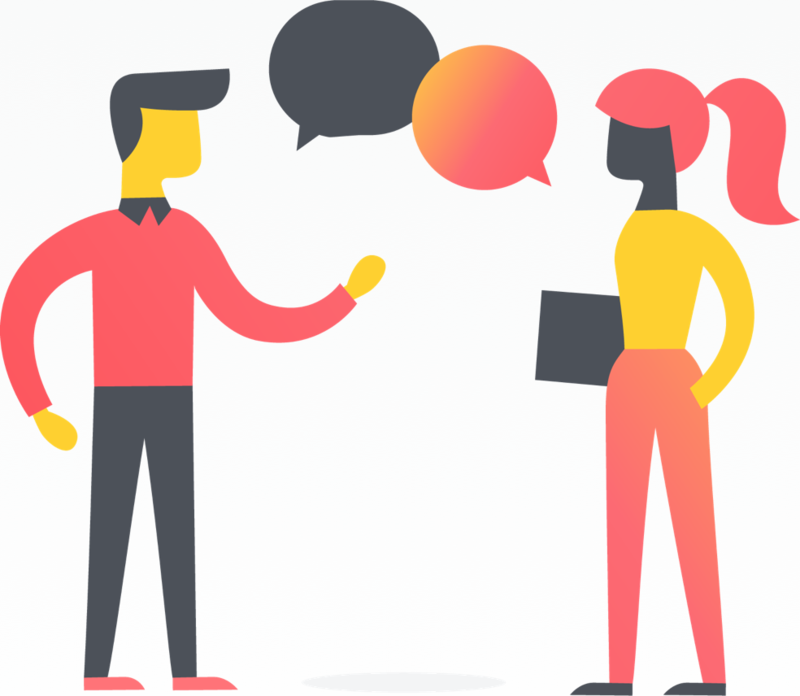 A subtask cannot have the same name as the task it is a subtask of. If the “subtask of” points to a non-unique task name, the subtask will become related to the closest matching task name that appears above the subtask.